When she was just a teenager, Evelyn Talbot was tortured and left for dead by her then boyfriend, Jasper Moore. He also murdered three of her friends. Now Evelyn is a psychiatrist who specializes in studying the psyche of serial killers and psychopaths. Though beautiful and very smart, she has never been able to completely recover from her traumatic ordeal. She is now thirty-six years old, and has not had a meaningful relationship with a man since then. Her conflicting emotions and grisly memories preclude her from having either an emotional or sexual relationship. She is married to her work. Her only companion is her cat, Sigmund. To that end, she has been instrumental in founding a new psychiatric facility. The new facility, “Hanover House” is to be located in remote Alaska due to the fact that the lower forty-eight states want to stash their most fearsome criminals as far away from them as possible. When Evelyn is notified that Hanover House, which is under construction, was vandalized, she flies to Alaska to assess the damage. There she meets with Alaskan State Trooper, Sergeant Amarok. Though he is a few years younger than Evelyn, he is drawn to her beauty, her brain, and her well disguised vulnerability. She in turn is overwhelmingly attracted to the strong and handsome policeman. Though it is an attraction that she is unable to act upon due to her emotional scars. Having eluded the authorities for twenty years, Jasper Moore is still killing young women. He now goes by the name of Andy Smith. When Jasper, aka Andy, enters Evelyn’s world for a second time, her justifiable paranoia is proven sound. When Evelyn’s life is endangered, Amarok acknowledges his feelings for Evelyn, but is aware that little will ever come of them…. or will they… ? I guess you’ll just have to read “Whiteout“, the first book in the Hanover House series. This novella was a very fast read due to the short length, fast-pace, and the dynamic writing. Readers who enjoy a little entertaining escapism and all fans of romantic suspense will love this series prequel, of that I am sure. 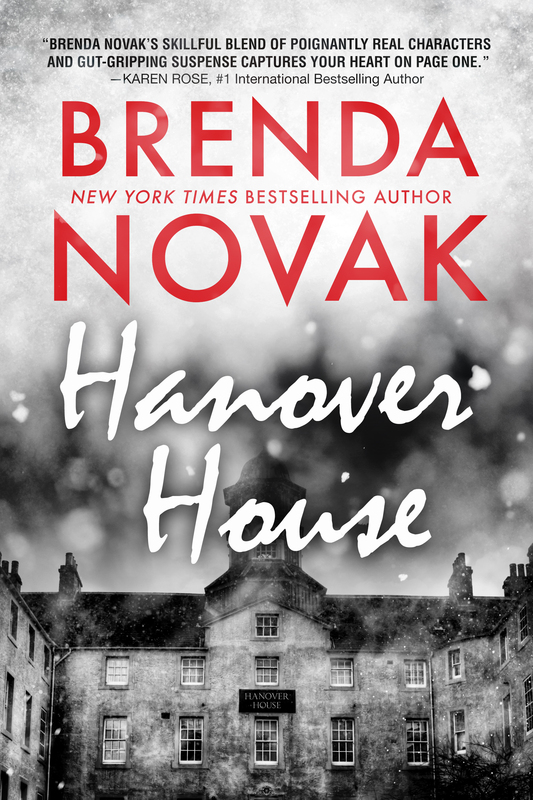 Thanks to the author and St. Martin’s Press via NetGalley for my digital ARC of “Hanover House”. Brenda Novak is the author of historical romance, contemporary romance, and romantic suspense. She has written nearly 50 books, and has sold more than 4 million copies. This entry was posted in Book Reviews, Fiction, NetGalley, Novellas, Page turners, romantic suspense and tagged novels, page-turners, romantic suspense, Setting, thrillers. Bookmark the permalink. This is a story on a entire different level. It will straight up take you away. When you close this book, you will have to take a minutes to come back to reality . I also suggest to read http://bit.ly/2us5zxq Melanie Claire . Thank you P.S: I like this website.